Sea Spray: HST Pillow Completed!!! “Sea spray is a spray of seawater that forms when ocean waves crash, or high winds are blowing.” (from wikipedia). That, I think, perfectly describes this finished HST pillow. It was a dash to the finish, for sure, but I managed to finish my pillow that I am swapping this weekend. I based this pillow off “Crystallized” by Angela Mitchell’s pattern in the Pillow Pop book (page 82). Instead of using the warm and cool color combinations, I swapped the warm for low-volume prints and made the cool color rings a single color within a the ring (not mixed). I quilted irregular lines in the low volume portion of the pillow, which you can see more clearly in this close-up. 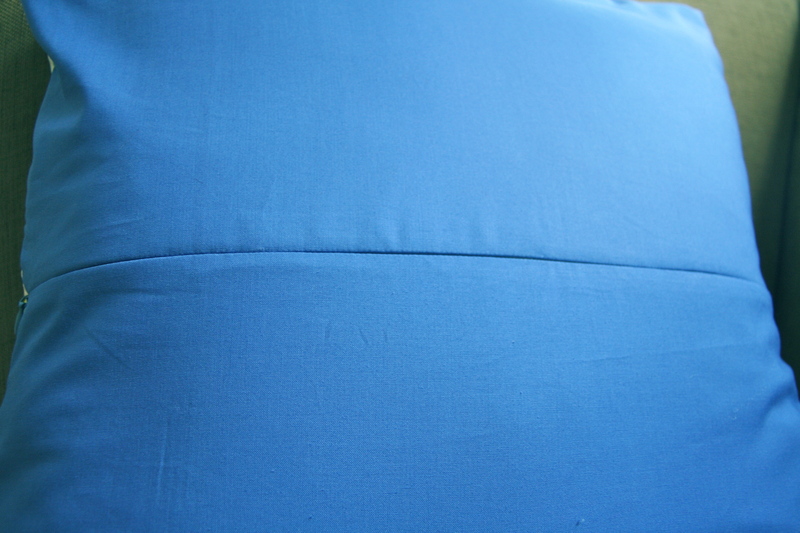 The back of the pillow I kept simple with using a single Kona Blue fabric. The opening I used an invisible zipper through the middle of the pillow (as I had done in my other two cushions blogged here). I am including a picture of the pillow top backing, as you can really see the quilting. The top, I used organic cotton batting with muslin as the backing which is what you see here. So I love the finish, the hubby wanted to keep it…..I hope my swap partner likes it!! I blogged previously, showing photos of the making of the pillow – those can be found here and here. I shared the above photos on the “Pillow Pop” flickr group – in case you are interested in joining. I am linking up with AmandaJean @ CrazyMomQuilts for Finish it up Friday. 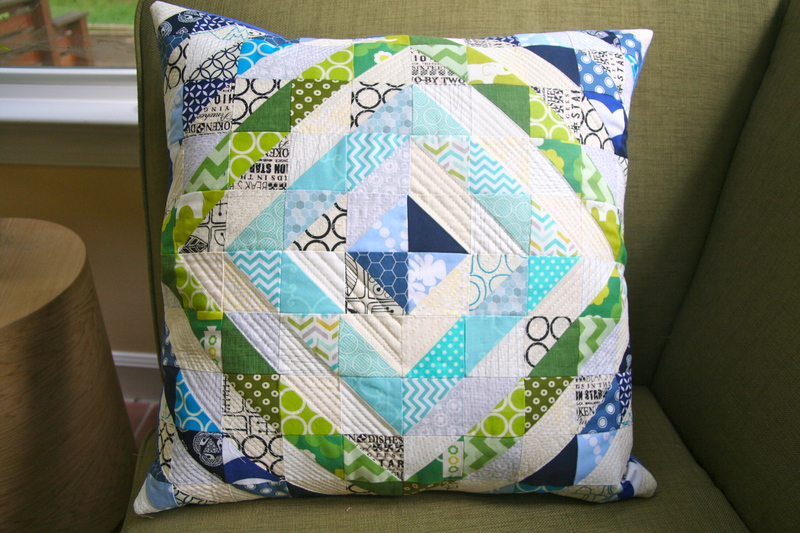 This entry was posted in Uncategorized and tagged Angela Mitchell, Blue, Crystallized, cushions, Finish it up Friday, green, Half Square Triangles, HST, low volume, patchwork, Pillow pop, pillows, quilt, quilted, quilting, Sea Spray, sewing, swap on June 6, 2013 by mlwilkie. That’s fantastic! It came out beautifully. I heart it and someone is getting a really great gif! Love colors and the LV background. Beautiful pillow! Your partner will LOVE it. 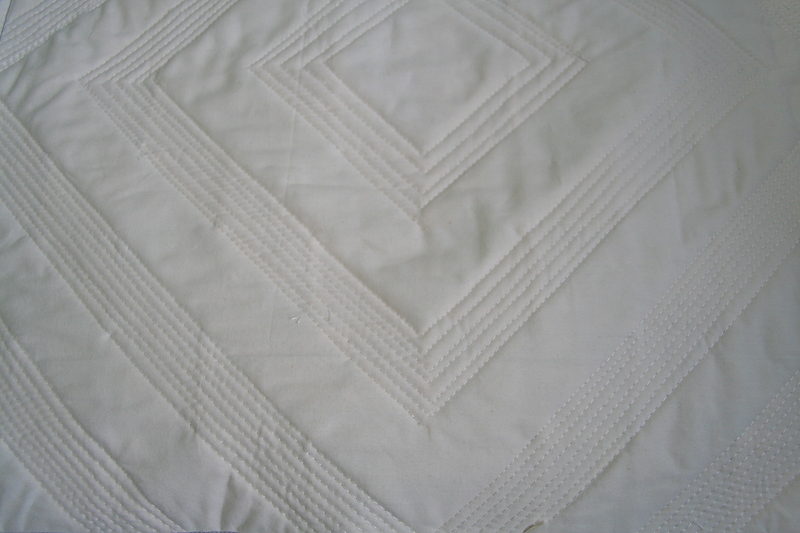 I love the close up of the delicious straight line quilting. I find in my own work that sometimes the blue-green combo can get mushy-looking (if that descriptor makes sense?) BUT your colors are bright and crisp. Great job! i always feel that way about handmade gifts! so much time involved and a bit of yourself, too. if she doesn’t like it, you can send it to me. =) but of course she will. Ahhh! Michelle, I love this! Stellar job on all parts, but I especially love your quilting work. She’s going to love it for sure! i am working on a hst quilt that is almost identical in pattern. am loving it. your pillow turned out fantastic. i especially like your choice of handquilting. superb! Do you have a link of your quilt – I will love to see it and watch the process. So beautiful! Love the fabric choices and the quilting! Beautiful pillow! 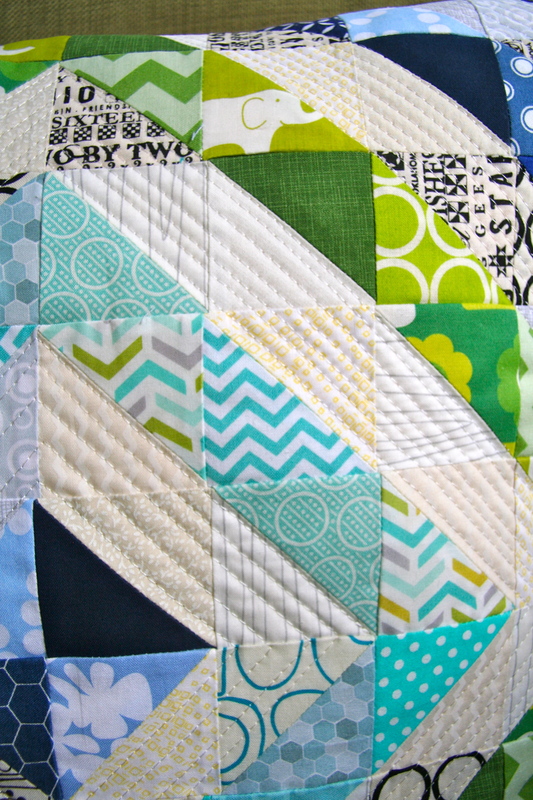 Love the color combinations and the quilting! A wonderful finish! Thank you, my swap partner asked for blue and green so it worked perfectly. You can’t beat those HSTs, and what a great small project to get a HST fix! It was a great project!! I see many more HST projects coming up in my future.